Email is one of the central tools of digital marketing and yet is the most underused personalization channel. It gives you direct access to your market 24/7 and helps you stay top-of-mind throughout the sales cycle. But email marketing can be extremely challenging with problems around delivery, open rates, spam regulations, and more. Furthermore, many email marketers fail to notice the bigger picture. Email marketing doesn’t stop when an email is opened. Understanding what happens after your message is opened is equally critical for tracking the impact of your email campaigns. 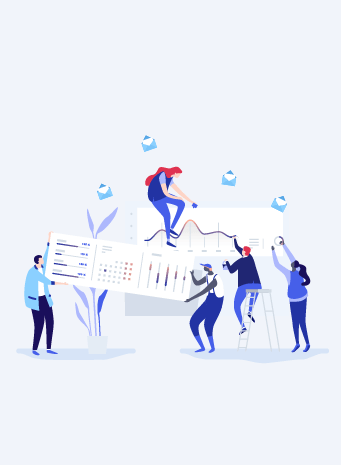 While we were trying to set our email marketing strategy, we knew we needed a data-driven approach to our email campaigns in order to crack success in the first go. Here’s how we did it and what we learned along the way, so you can do the same. When we started our first email campaigns at CleverTap, we had around 40K+ contacts sourced from our website, blog, social media channels, referral marketing, AdWords, and events. Every month, more than 10,000 marketing qualified leads were added to the database. We use HubSpot for our marketing email campaigns because of the detailed click map reports. We were at the industry norm for open rates, at an average 26%, with a click-through rate of 7%. So far so good, but something was amiss. Despite having such solid open and click-through rates, we were sorely lacking in conversions. At this point, we decided to dedicate someone to manage the email marketing process and nurturing (better conversions) full-time. I raised my hand and gladly took it on. Seeing so much data at once was overwhelming. Hundreds of campaigns had been executed, with thousands of emails sent to over 40,000 contacts. So, I began the gruelling exercise of identifying patterns, running A/B tests, and creating a strategy to drive conversions. Over the following months, I’ve learned a lot about how to use analytics to make smarter email marketing decisions. Here are my takeaways from the experience and my advice to mobile marketers wanting more effective email campaigns. Despite scepticism from many marketers, email is one of the most effective methods of marketing. Email Monday found that every dollar invested in email resulted in a return of $44. That’s a tremendous ROI. US marketers found that email had a median ROI of 122%, which is more than four times higher than paid search, social media, and direct mail. Engagement and market penetration are off the charts. And there’s no slowdown in sight: while other communication methods are picking up speed, every industry still sends billions of emails daily. From B2B to healthcare, banking to e-commerce, every business is leaning on this channel to improve conversion rates. Email marketing has the potential to drive a huge amount of revenue for your company. But it gets more difficult every passing day. Consumers are quick to unsubscribe, or worse, mark you as spam. Younger, tech-savvy audiences are happy to receive an email that’s useful or interesting but has access to dozens of tools that keep unwanted email out of sight. And SPAM rules are getting stricter, with mail providers all trying to eliminate it via advanced modifications to their algorithms. It’s very easy to get email marketing wrong. Which is why you should spend time figuring out how to set things up correctly from the get-go. Our marketing team believes in numbers and in creating processes that are logical and easy to understand. We knew we needed a defined process to optimize our email marketing efforts that we could test and improve. Before we get to the details of email marketing, I personally recommend every marketer must check their ‘Sender Reputation Score’ for their particular domain. A fresh domain has a score of 100. As you execute campaigns, factors like unsubscribes, opens, clicks, marked as spam, time spent, and bounces affect your score. If your score dips below 70, aggressive email filtering will be applied to every message coming from your domain. In short, the likelihood that anyone even receives your emails is almost nil, and you’ll probably have to buy a fresh domain for sending emails. When I spoke with an email marketing expert running a thriving cold email business, he told me that they buy a new domain every week to ensure that sender scores are high enough for emails to be delivered. 1. Who Are You Emailing? The big question with email marketing is: “How did you get all these email addresses?” And in my experience, the best way to acquire email addresses is organically. Paid lists never work. Not to mention, it’s illegal to send emails to someone who hasn’t consented to receive them. Email marketing is all about communicating with people who want to hear from your brand. Having said that, cold emailing still does work for sales. But for core email marketing, I strongly recommend staying away from purchased lists and instead try content syndication. We collect emails from social media, AdWords, organic, content syndication, referral marketing, the list goes on. But more important than the source is the intent someone had in giving us their email addresses. Someone who submits their email at a demo page has a totally different expectation from someone who downloads a whitepaper. The best way to understand and engage different audiences is SEGMENTATION! List segmentation is one of the core strategies that we use to ensure our email marketing is effective. These types of categories might not apply to your business, but there are always many different methods you can use to segment your own email list. For more ideas on this, HubSpot posted a list of 30 different segmentation strategies, ranging from age to change in content engagement. You don’t need to start with anything complicated. Segmenting your list should be the first step you take when you decide to improve email marketing. You’ll need a lot of data to do it right, and you’ll want to keep collecting data as you start the A/B testing process. Using a small number of segments is a good way to keep the process manageable. For example, you might try simply segmenting your list into customers and non-customers. The marketing emails you send to those groups should be different because the goals are different: acquisition and retention require distinct marketing messages. Or you could segment based on product interest. If you have more than one product or service, create a couple of lists that contain customers who have expressed interest in a particular product or service. The best method of segmentation will depend on your company, your marketing goals, and your customers. Apart from segmentation, one more crucial habit you need to imbibe is to clean your lists. I started with 40,000+ contacts, but over a period of three months, I realized that around 5,000+ were contacts who never opened emails, or where the emails bounced — factors that negatively impact the domain’s sender score. After this initial clean up, we saw a jump in our open rates and click-through rates. Our open rate that had been at 26% for the previous five campaigns suddenly spiked to 43%, then averaged 36% the rest of the time. Our 7% click-through rate jumped to 14% and is now averaging at 12%. This might appear to be a tedious task, but it promises tremendous worth. It’s better to be informed about the true potential of your mailing list than settle for thousands of redundant contacts that will never convert, resulting in wasted time and resources (remember that every email costs you). 2. What Are You Sending? The success of an email sent to the right person depends on two basic things: content and design. Here are a few pointers that help in creating a nearly perfect email. Your emails contain basically 3 main chunks of content: the subject line, the preheader text, and the body of the email. So all the optimization needs to be done in those three areas. Personalize your subject lines: Emails with personalized subject lines are 26% more likely to be opened. When you receive an email with your name in the subject line, it immediately draws attention. Personalize the body of the email: If you have relevant data about your customer such as company name, title, pages visited on your site, purchase history, etc., you could use that data to your advantage to create rapport with them. In these cases, personalization tokens help a lot. Use first person point-of-view: When have you ever received an email from a friend talking in the third person? Email providers now use AI to try and weed out emails that do not sound like they come from a human being. To avoid that, always use the first person in emails. It is more comfortable and feels more like a genuine conversation. Be brief: The shorter the email, the better the results. No one has the time to read lengthy emails. Keep them succinct and focus on the action you want the reader to take. Avoid spam words: Here’s a list of words you should try and not incorporate in your emails. Create mobile-friendly emails: 67% of emails are now read on mobile devices. That is another reason why the formatting of your email must absolutely be responsive on all devices. Limit the number of links in HTML emails: HTML templates have 25% lower open rates due to non-delivery. Traditional marketing tells us that visuals grab people’s attention—and HTML emails include lots of images and colours to do that. But many companies have had success with plain text messages that include only one or two simple images (usually the company logo or an image of the sender). If you have to use HTML, then make sure there aren’t too many links inside it. Initially, we used to have 12-13 links within our newsletter emails. Our click-throughs and open rates were both impacted. When we brought it down to 6 major links in the top fold of the emails, our click-through rate drastically improved. Call-to-action text: Every email should have a call to action. A button that says “Buy Now,” a text link to “Find out more,” or an encouragement to respond to the email all get your customer to act. Changing the format and text of that CTA can have a significant effect on your click-through rate. Try turning a button into text, adding an exclamation point, asking a question, or changing the font or button colour. You might be surprised at the effect. And that’s a wrap for setting up your email marketing process. With all of this in place, you can rest assured that nothing will technically go wrong with your campaigns. We send thousands of emails every month, personalizing them to achieve our revenue goals. And we’ve seen the advantages of setting up your email process correctly from the start. In the next blog post, we will talk about how to use all the data and analytics you have to deliver emails more efficiently to your users and improve your conversions. Until then, send great emails and never spam! Know the science behind creating a perfect email marketing strategy.